This advanced confined space training covers the entering and working in confined spaces in resources and infrastructure industries. It includes planning and preparing (conducting a hazard analysis) for entry of confined spaces, entry and working in confined spaces, exiting confined spaces and cleaning up. This training course also addresses the need for personnel who issue work permits to understand the permit system, know the limitations of each permit and make decisions regarding the need for and correct use of each permit. This competency unit includes the issue of any and all permits. This training course is also about testing the working atmosphere (gas testing) to determine if it is safe for the proposed work. Testing involves the use of electronic test apparatus. In order to safety supervise and run a confined space project you may require our advanced training, although you may not need to enter the space yourself, you need to be aware of the risks and equipment checks that need to be in place to adequately protect people under your control. However, in order to be completely compliant and cover all positions required with confined space work you or your team may require our additional training which includes operate breathing apparatus, first aid and confined space rescue training. 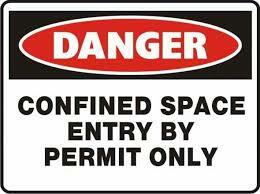 Please see our other confined space courses we offer under our Courses tab. covers the skills and knowledge required to issue work permits. It covers an understanding of the permit system and the limitations of each permit, and making decisions regarding the need for and correct use of each permit. This unit includes the issue of any and all permits. Permits are called ‘clearances’ by some organisations. testing the working atmosphere to determine if it is safe for the proposed work. Testing involves the use of electronic test apparatus. This includes confined spaces, enclosed and partially enclosed spaces, hot work, storage tanks, silos, pits, pipes, shafts, ducts, transport vehicles and ships, testing as part of issuing a work permit, monitoring as part of working under a work permit, open areas, holding the gas tester by hand and lowering the gas tester into a space, e.g. on a line.